Here is Patrick wearing our AR goggles/camera. Bringing Open Hypermedia into AR See Patrick's pages. Auto-camera calibration and AR see my PhD Student Junaidi's pages. We are working mainly with the ARToolkit which provides a nice way to get AR working, using marker cards and even just a Webcam. 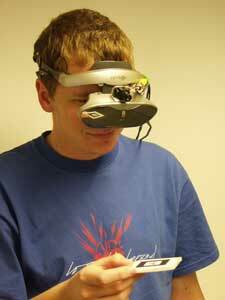 AR is different to Virtual Reality (VR) in that the real world is still visible and digital objects are added in. VR is usually a completely synthetic world which tries to replicate real scenes.